1779 was a tempestuous year: the American War of Independence raged on, as did in war in Europe and India. In Britain the cogs of industrial revolution were first put into motion, and with all heat, smoke and steam that accompanied it. Meanwhile, in Islay, the spirit ran for the first time from the stills of Bowmore distillery, and perhaps the whisky has absorbed some of the fire and ferocity of its birthyear. Bowmore is one of the oldest distilleries in Scotland, and the whisky reflects that, a dignified and balanced dram that is not as peat heavy as the distillers in the south of the island, nor as light as those in the north. Bowmore distillery is found in the county capital of Islay, from which it takes its name, and it certainly produces a ‘capital’ malt, one of the top two best-selling Islay whiskies. Bowmore still operates a floor malting, and around 40% of the malt used in their whisky comes from this malting, with the rest being bought from the Port Ellen maltings. They use the industry standard Optic malt, but peated to only 25ppm, less than the likes of Laphroaig and Ardbeg. This means the finished spirit has a ppm of only around 8 – 10. The malt is ground by a porteous mill before transfer to a single stainless steel semi-Lauter mashtun. It is watered three times at temperatures ranging from 84-100 degrees. The wort is then pumped into 6 Oregon pine washbacks, then Mauri and Quest yeast strains are added with a ration of 75:25. Fermentation occurs for between 48 (shorts) and 62 (longs) hours at 19Co. The wash strength is 7%. Bowmore doesn’t know when their wash stills were constructed exactly, what it does know is that there are two of them, with a capacity of just shy of 31,000 litres each. They are 6.3 metres high, and heated with steam pans and coils. The low wines are run through these for 8 hours. Unusually Bowmore’s two spirits stills have different capacities- the first being 14,750 litres, and the second 14,637 litres. They are both 5.8 metres and again heated with steam pans and coils. The foreshot run is merely 15 minutes long, whilst the spirit run takes between 2-3 hours and the feints takes 3-4. Bowmore take the cut at between 74% abv - 61.5% abv. The distillery stores its spirit at 63.5%, in 70% American oak barrels, 15% sherry hogsheads and puncheons, and another 15% reconstructed American oak hogsheads. The distillery also uses a very small number of port casks. They have one warehouse at the distillery and two just outside town on the "low road"- two of these three are dunnage style, the other is racked. The whisky is bottled and vatted in Springburn, Glasgow. Bowmore was founded by a merchant, John P Simpson, who then passed the distillery on to a family of German investors, the Mutters. Patriarch of the family, James Mutter was vice consul representing the Ottoman empire, Portugal and Brazil at their Glasgow consulates. The Mutters also made a series of improvements to the distillery, constructing steam ships to take coal from the mainland, and ship their whisky on the return trip. The Mutters remained in charge for the whole 19th century, until JB Sheriff & Co. bought Bowmore in 1925. After a quarter of a century, a company from Inverness, William Grigor & Son, purchased the distillery. A company called Morrison’s Bowmore Distillery Ltd. took over in 1963, building a visitor centre and increasing the number of stills to four. In turn, they were purchased by Japanese drinks giants Suntory in 1994. Suntory had been a large shareholder in the company for many years before that. The building of the visitor centre was an early nod to the excellent marketing that Bowmore would employ in the late years of the 20th century. Bowmore was one of the first distillers to get a wider range out on there on the shelves of shops, alongside the likes of Glenfiddich, Macallan and Glenfarclas. However the marketers got some things very, very wrong during this time. During the 90s a strange phenomenon was noted in some Bowmore bottlings, which went by the acronym "FWP". "FWP" stood for French Whore Perfume, a term coined by the then fledging internet whisky community to describe a particularly unpleasant pungent soapy aroma that accompanied seemingly random bottlings of Bowmore. Initially the PR people at the distillery said that there was no such thing, before later turning aggressive and threatening sue members of said whisky community if they continued to write about FWP online. Thankfully, this entire messy issue seems to have blown over long ago (with FWP only seeming to affect random batches distilled in the early 80s), and the distillery is now producing malt of the highest quality, without a trace of FWP. 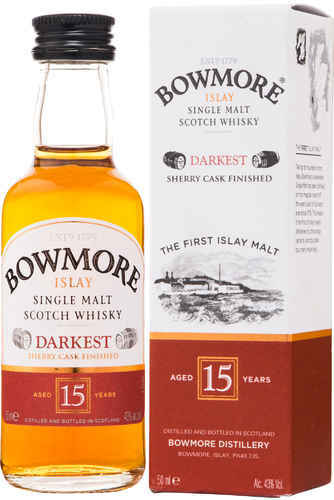 Bowmore offers a wide range of aged stated whiskies with the 10 yo Tempest (Cask Strength), Bowmore 12, 15 Darkest, 15 Laimrig, 18 and 25. They also have a trio of Non Age-Statement travel retail releases: White Sands, Black Rock and Gold Reef. In addition to this there is the NAS Legend, 100 Degrees Proof (also travel retail) Small Batch and Surf. A recent addition is the annually released 10 year old "Devil’s Cask", matured in first fill sherry casks. Bowmore seems to release a lot of quite old special edition whiskies, from the 1980 bottling from the day the Queen visited, to the 23 y/o Port Cask, to the 29 year old Black Bowmore (which went on the market for a mere £2,900). In 2010 they released a 40 year old whisky, with some of the most ornate packaging ever seen. Of course, they also have a 25 year old as part of their standard range. In the early 2000s Bowmore experimented with two NAS and finished whiskies, Dawn (port finished) and Dusk (Bordeaux finished. More recently, the 10 year old Devil’s Cask releases have become something of a cult expression, selling out quickly and highly praised. Despite being the earliest distillery on Islay, Bowmore has only been out of production during the two World Wars, where it served as a base for RAF flying boat missions and anti-submarine activity. Waste heat from whisky production goes to warm the waters of a public swimming pool in one of the distilleries old buildings. 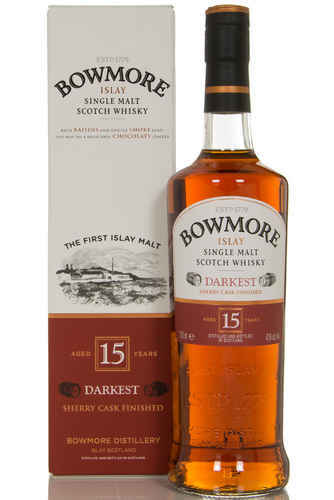 In 2007 a bottle of Bowmore Single malt from 1850 sold for £29,400. The Devil’s Cask bottling takes its name from a local legend. The story goes that the devil visited Bowmore’s famous round church, the shape of which meant there was no corner for him to hide in. As such the local faithful spotted the devil and hounded him out, chasing him through the town down to the distillery. Unfortunately, the workers happened to be loading the boat at the very moment, and despite searching the distillery high and low, and locking all the doors and windows, they couldn’t find the devil. It appears he escaped in a cask of whisky bound for the mainland. The tempting tastes of this release could indeed have been a trick of the devil!